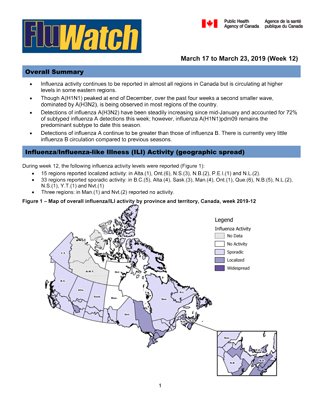 Influenza activity continues to be reported in almost all regions in Canada but is circulating at higher levels in eastern regions. Detections of influenza A(H3N2) have been steadily increasing since mid-January and accounted for 64% of subtyped influenza A detections this week; however, influenza A(H1N1)pdm09 remains the predominant subtype to date this season. There is currently very little influenza B circulation compared to previous seasons. The World Health Organization (WHO) has released the recommended composition of the influenza vaccine for use in the 2019-2020 northern hemisphere influenza season. The recommended strain was changed for each of the A(H1N1)pdm09 and A(H3N2) components compared to this year's vaccine. 19 regions reported localized activity: in Alta. (2), Man. (1), Ont. (6), Que. (3), N.S. (4), N.B. (1), and N.L.(2). Five regions: in Man. (2), Nvt. (2) and N.W.T. (1) reported no activity. The percentage of tests positive for influenza continued to increase slightly to 21.4%. A total 1,721 laboratory detections of influenza were reported, of which 95% were influenza A. Influenza A(H3N2) accounted for 64% of subtyped influenza A detections. Detections of influenza A(H3N2) have been steadily increasing, from 93 detections in week 4 (mid-January) to 339 this week. 98% have been influenza A. Among the 12,926 influenza A viruses subtyped, 83% have been A(H1N1)pdm09. 84% of all influenza A(H1N1)pdm09 detections have been reported in individuals younger than 65 years of age. 59% of all influenza A(H3N2) detections have been reported in adults 65 years of age and older. Table 1 - Note 1 UnS: unsubtyped: The specimen was typed as influenza A, but no result for subtyping was available. In week 11, 0.7% of visits to healthcare professionals were due to influenza-like illness (ILI) (Figure 4). The percentage of visits for ILI is low compared to previous seasons. In week 11, 2,066 participants reported to FluWatchers, of which 54 (2.7%) reported symptoms of cough and fever (Figure 5). 75% reported days missed from work or school, resulting in a combined total of 124 missed days of work or school. 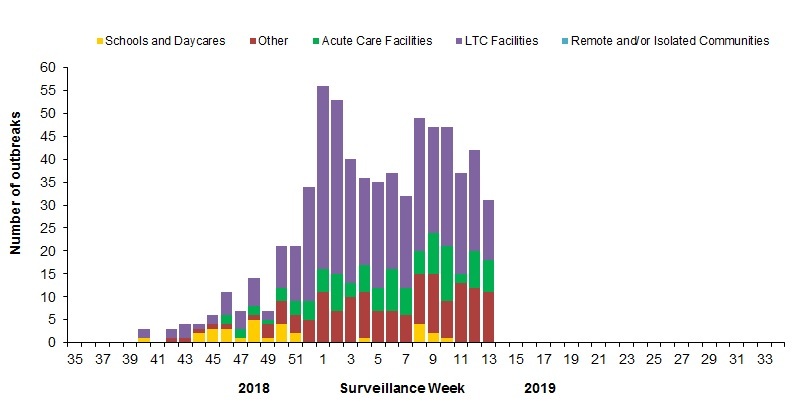 In week 11, 29 new laboratory-confirmed influenza outbreaks were reported: long-term care facilities (LTCF) (16), acute care facilities (2) and other settings (11). Two new ILI outbreaks (one in a school and one in a LTCF) were also reported in week 11. 346 (59%) outbreaks were in LTCF, 29 were in schools, 86 in acute care facilities, and 125 were in other settings. Among the 523 outbreaks for which the influenza type was available, 98% (512) were associated with influenza A. To date this season, 121 ILI outbreaks have been reported; 65 occurred in LTCF, 52 in schools, and four in acute care facilities. To date this season, 2,474 influenza-associated hospitalizations have been reported by participating provinces and territoriesFootnote1. The highest estimated rate of hospitalization is among adults over 65 years of age. To date this season 446 ICU admissions and 109 deaths have been reported. 42% (189) of reported ICU admissions were in adults aged 45-64 years. All but four ICU admissions were associated with influenza A. All but one of the deaths were associated with influenza A. Table 2 - Note 1 Influenza-associated hospitalizations are reported by Alberta, Manitoba, New Brunswick, Newfoundland and Labrador, Northwest Territories, Nova Scotia, Prince Edward Island and Yukon. 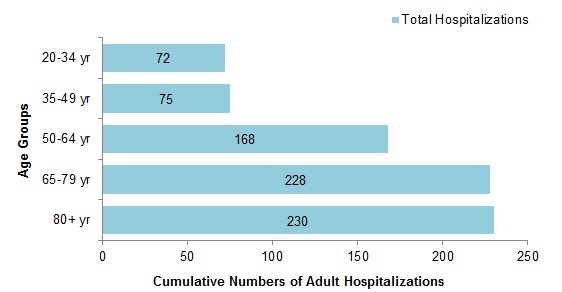 Only hospitalizations that require intensive medical care are reported by Saskatchewan. The cumulative rate of hospitalizations is calculated using the total population by age-group in participating provinces and territories. 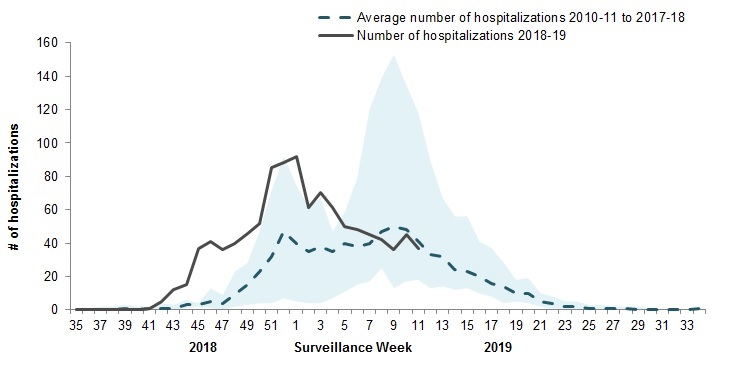 In week 11, 37 pediatric (≤16 years of age) hospitalizations with influenza have been reported by the Immunization Monitoring Program Active (IMPACT) network (Figure 7). 67% of cases were in children under 5 years of age. 97% (1,017) of cases have been associated with influenza A. Among the 316 cases for which the influenza subtype was available, 286 (91%) were associated with A(H1N1)pdm09. To date this season, 188 ICU admissions, and 10 deaths have been reported. 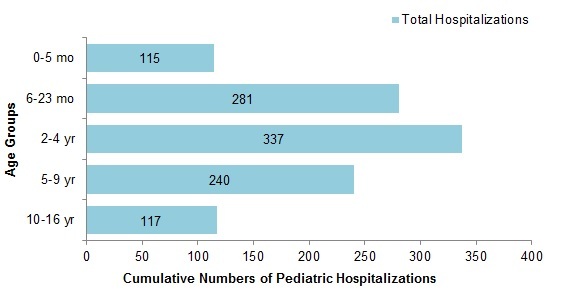 61% (114) of ICU admissions were in children under 5 years of age. All but two of the ICU admissions have been associated with influenza A. 676 (93%) hospitalizations were associated with influenza A. 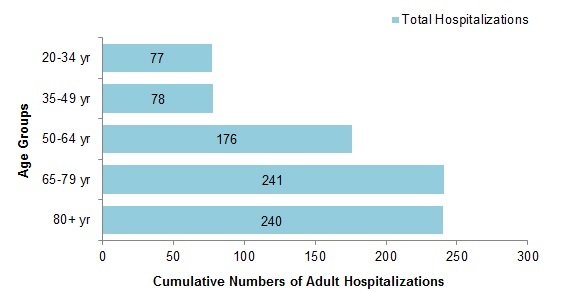 A greater proportion of hospitalizations have been reported among adults ≥65 years of age (59%) compared to adults <65 years of age (41%). 86% of hospitalized cases reported more than one type of comorbid condition. The most commonly reported comorbidity was endocrine disorders, which were reported in 82% of hospitalized cases. Since September 1, 2018, the National Microbiology Laboratory (NML) has characterized 1,622 influenza viruses (212 A(H3N2), 1,375 A(H1N1) and 35 B) that were received from Canadian laboratories. 102 influenza A(H3N2) viruses did not grow to sufficient hemagglutination titer for antigenic characterization by hemagglutination inhibition (HI) assay. Therefore, NML has performed genetic characterization to determine the genetic group identity of these viruses. 17 viruses belonged to genetic group 3C.2a. 82 viruses belonged to subclade 3C.2a1. Two viruses belonged to 3C.3a. 74 influenza A(H3N2) viruses were antigenically characterized as A/Singapore/INFIMH-16-0019/2016-like by HI testing using antiserum raised against egg-propagated A/Singapore/INFIMH-16-0019/2016. 27 viruses showed reduced titer with ferret antisera raised against egg-propagated A/Singapore/INFIMH-16-0019/2016. 53 influenza A(H3N2) viruses characterized belonged to genetic group 3C.2a1. 16 viruses belonged to genetic group 3C.2a and 21 to 3C.3a. Sequencing is pending for the remaining isolates. 1,336 A(H1N1) viruses characterized were antigenically similar to A/Michigan/45/2015, which is the influenza A(H1N1) component of the 2018-19 Northern Hemisphere influenza vaccine. Nine influenza B viruses were characterized as B/Colorado/06/2017, which belong to the Victoria lineage and are included as an influenza B component of the 2018-19 Northern Hemisphere influenza vaccine. Seven viruses showed reduced titer with ferret antisera raised against cell culture-propagated B/Colorado/06/2017. 19 influenza B viruses were characterized as B/Phuket/3073/2013-like, which belongs to the Yamagata lineage and is included as an influenza B component of the 2018-19 Northern Hemisphere quadrivalent influenza vaccine. 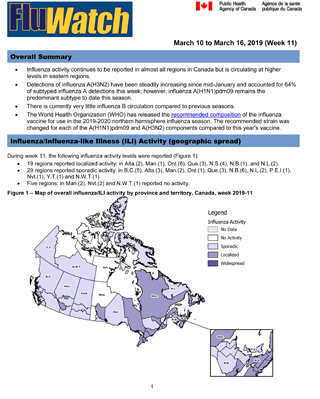 Influenza activity continues to be reported in almost all regions in Canada but is circulating at higher levels in some eastern regions. Though A(H1N1) peaked at end of December, over the past four weeks a second smaller wave, dominated by A(H3N2), is being observed in most regions of the country. Detections of influenza A(H3N2) have been steadily increasing since mid-January and accounted for 72% of subtyped influenza A detections this week; however, influenza A(H1N1)pdm09 remains the predominant subtype to date this season. 15 regions reported localized activity: in Alta. (1), Ont. (6), N.S. (3), N.B. (2), P.E.I. (1) and N.L.(2). Three regions: in Man. (1) and Nvt. (2) reported no activity. The percentage of tests positive for influenza continued to increase slightly to 21.8%. A total 1,735 laboratory detections of influenza were reported, of which 93% were influenza A. Influenza A(H3N2) accounted for 72% of subtyped influenza A detections. Detections of influenza A(H3N2) have been steadily increasing, from 93 detections in week 4 (mid-January) to 342 this week. Among the 13,414 influenza A viruses subtyped, 81% have been A(H1N1)pdm09. 57% of all influenza A(H3N2) detections have been reported in adults 65 years of age and older. Return to Table 1 - Note1 referrer. In week 12, 1.6% of visits to healthcare professionals were due to influenza-like illness (ILI) (Figure 4). In week 12, 2,056 participants reported to FluWatchers, of which 50 (2.4%) reported symptoms of cough and fever (Figure 5). 92% reported days missed from work or school, resulting in a combined total of 136 missed days of work or school. 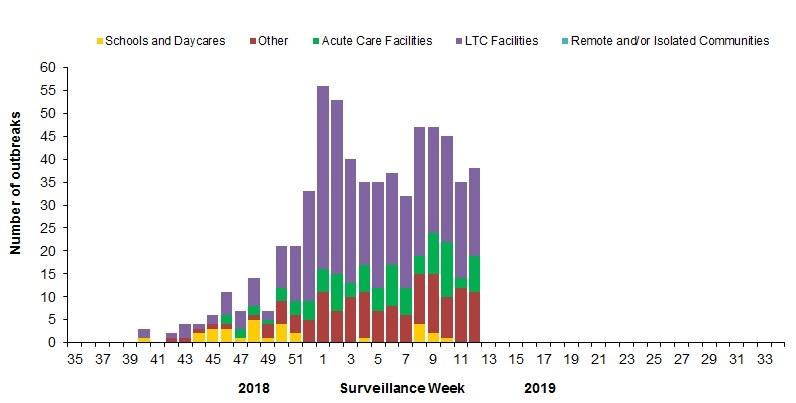 In week 12, 38 new laboratory-confirmed influenza outbreaks were reported: long-term care facilities (LTCF) (19), acute care facilities (8) and other settings (11). Eleven new ILI outbreaks (LTCF (8) and schools and daycares (3)) were also reported in week 12. Among the outbreaks with available subtype information (12), 92% (11) were associated with influenza A(H3N2). 371 (59%) outbreaks were in LTCF, 30 were in schools and daycares, 94 in acute care facilities, and 138 were in other settings. Among the 563 outbreaks for which the influenza type was available, 98% (550) were associated with influenza A. To date this season, 134 ILI outbreaks have been reported; 75 occurred in LTCF, 55 in schools, and four in acute care facilities. To date this season, 2,592 influenza-associated hospitalizations have been reported by participating provinces and territoriesFootnote1. Among the 1,555 cases for which the influenza subtype was available, 1,366 (88%) were associated with A(H1N1)pdm09. To date this season 464 ICU admissions and 127 deaths have been reported. 43% (199) of reported ICU admissions were in adults aged 45-64 years. In week 12, 41 pediatric (≤16 years of age) hospitalizations with influenza have been reported by the Immunization Monitoring Program Active (IMPACT) network (Figure 7). Of the 41 hospitalizations, 34 (83%) were due to influenza A. 97% (1,054) of cases have been associated with influenza A. Among the 324 cases for which the influenza subtype was available, 289 (89%) were associated with A(H1N1)pdm09. To date this season, 194 ICU admissions, and 10 deaths have been reported. 60% (117) of ICU admissions were in children under 5 years of age. 718 (93%) hospitalizations were associated with influenza A. Among the 167 cases for which the influenza subtype was available, 103 (62%) were associated with A(H1N1)pdm09. 88% of hospitalized cases reported more than one type of comorbid condition. The most commonly reported comorbidity was endocrine disorders, which were reported in 83% of hospitalized cases. Since September 1, 2018, the National Microbiology Laboratory (NML) has characterized 1,700 influenza viruses (233 A(H3N2), 1,415 A(H1N1) and 52 B) that were received from Canadian laboratories. 124 influenza A(H3N2) viruses did not grow to sufficient hemagglutination titer for antigenic characterization by hemagglutination inhibition (HI) assay. Therefore, NML has performed genetic characterization to determine the genetic group identity of these viruses. 18 viruses belonged to genetic group 3C.2a. 102 viruses belonged to subclade 3C.2a1. Three viruses belonged to 3C.3a. 82 influenza A(H3N2) viruses were antigenically characterized as A/Singapore/INFIMH-16-0019/2016-like by HI testing using antiserum raised against egg-propagated A/Singapore/INFIMH-16-0019/2016. 63 influenza A(H3N2) viruses characterized belonged to genetic group 3C.2a1. 17 viruses belonged to genetic group 3C.2a and 29 to 3C.3a. Sequencing is pending for the remaining isolates. 1,375 A(H1N1) viruses characterized were antigenically similar to A/Michigan/45/2015, which is the influenza A(H1N1) component of the 2018-19 Northern Hemisphere influenza vaccine. 18 influenza B viruses were characterized as B/Colorado/06/2017, which belong to the Victoria lineage and are included as an influenza B component of the 2018-19 Northern Hemisphere influenza vaccine. 12 viruses showed reduced titer with ferret antisera raised against cell culture-propagated B/Colorado/06/2017. 22 influenza B viruses were characterized as B/Phuket/3073/2013-like, which belongs to the Yamagata lineage and is included as an influenza B component of the 2018-19 Northern Hemisphere quadrivalent influenza vaccine. 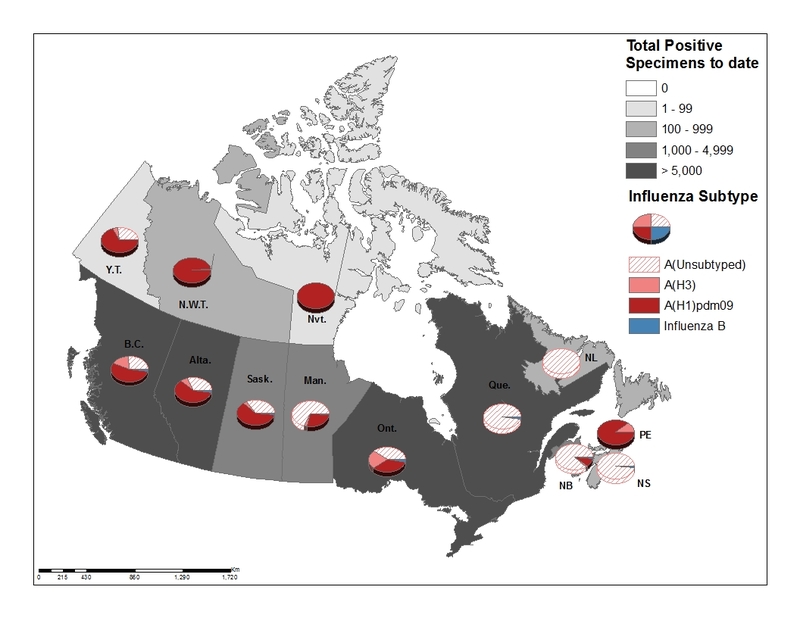 Influenza activity continues to be reported in almost all regions in Canada. Though A(H1N1) peaked at end of December, over the past five weeks a second smaller wave, dominated by A(H3N2), is being observed in most regions of the country. Detections of influenza A(H3N2) have been steadily increasing since mid-January and accounted for 76% of subtyped influenza A detections this week; however, influenza A(H1N1)pdm09 remains the predominant subtype to date this season. The 2018-19 Seasonal Influenza Immunization Coverage Survey showed that coverage was low among adults aged 18-64 years (34%) and highest among seniors aged 65 years and older (70%). 21 regions reported localized activity: in Alta. (2), Ont. (6), Que. (2), N.S. (3), N.B. (3), P.E.I. (1), Y.T. (1) and N.L.(3). Six regions: in Man. (2), N.S. (1) and Nvt. (3) reported no activity. The percentage of tests positive for influenza remained steady at 22%. A total 1,579 laboratory detections of influenza were reported, of which 91% were influenza A. Influenza A(H3N2) accounted for 76% of subtyped influenza A detections. Detections of influenza A(H3N2) have been steadily increasing, from 93 detections in week 4 (mid-January) to 358 this week. Among the 13,859 influenza A viruses subtyped, 79% have been A(H1N1)pdm09. 83% of all influenza A(H1N1)pdm09 detections have been reported in individuals younger than 65 years of age. 58% of all influenza A(H3N2) detections have been reported in adults 65 years of age and older. In week 13, 1.6% of visits to healthcare professionals were due to influenza-like illness (ILI) (Figure 4). In week 13, 2,041 participants reported to FluWatchers, of which 49 (2.4%) reported symptoms of cough and fever (Figure 5). 67% reported days missed from work or school, resulting in a combined total of 110 missed days of work or school. 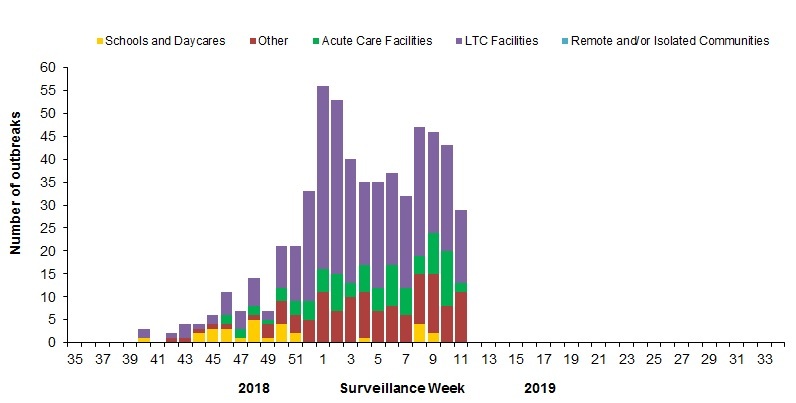 In week 13, 31 new laboratory-confirmed influenza outbreaks were reported: long-term care facilities (LTCF) (13), acute care facilities (7) and other settings (11). Three new ILI outbreaks (LTCF (2) and schools and daycares (1)) were also reported in week 13. Among the outbreaks with available subtype information (8), all (8) were associated with influenza A(H3N2). 385 (58%) outbreaks were in LTCF, 30 were in schools and daycares, 102 in acute care facilities, and 147 were in other settings. Among the 603 outbreaks for which the influenza type was available, 98% (590) were associated with influenza A. To date this season, 137 ILI outbreaks have been reported; 77 occurred in LTCF, 56 in schools, and four in acute care facilities. To date this season, 2,701 influenza-associated hospitalizations have been reported by participating provinces and territoriesFootnote1. Among the 1,629 cases for which the influenza subtype was available, 1,380 (85%) were associated with A(H1N1)pdm09. To date this season 474 ICU admissions and 139 deaths have been reported. 43% (202) of reported ICU admissions were in adults aged 45-64 years. In week 13, 30 pediatric (≤16 years of age) hospitalizations with influenza have been reported by the Immunization Monitoring Program Active (IMPACT) network (Figure 7). Of the 30 hospitalizations, 27 (90%) were due to influenza A. 96% (1,076) of cases have been associated with influenza A. Among the 330 cases for which the influenza subtype was available, 289 (89%) were associated with A(H1N1)pdm09. To date this season, 197 ICU admissions, and 10 deaths have been reported. 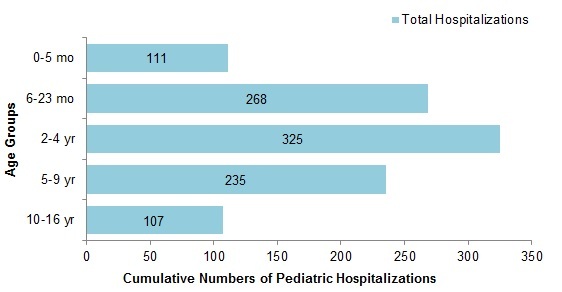 60% (119) of ICU admissions were in children under 5 years of age. All but six of the ICU admissions have been associated with influenza A. 757 (93%) hospitalizations were associated with influenza A. Among the 169 cases for which the influenza subtype was available, 105 (62%) were associated with A(H1N1)pdm09. Since September 1, 2018, the National Microbiology Laboratory (NML) has characterized 1,745 influenza viruses (244 A(H3N2), 1,445 A(H1N1) and 56 B) that were received from Canadian laboratories. 130 influenza A(H3N2) viruses did not grow to sufficient hemagglutination titer for antigenic characterization by hemagglutination inhibition (HI) assay. Therefore, NML has performed genetic characterization to determine the genetic group identity of these viruses. 108 viruses belonged to subclade 3C.2a1. 85 influenza A(H3N2) viruses were antigenically characterized as A/Singapore/INFIMH-16-0019/2016-like by HI testing using antiserum raised against egg-propagated A/Singapore/INFIMH-16-0019/2016. 29 viruses showed reduced titer with ferret antisera raised against egg-propagated A/Singapore/INFIMH-16-0019/2016. 64 influenza A(H3N2) viruses characterized belonged to genetic group 3C.2a1. 17 viruses belonged to genetic group 3C.2a and 29 to 3C.3a. Sequencing is pending for the remaining isolates. 1,404 A(H1N1) viruses characterized were antigenically similar to A/Michigan/45/2015, which is the influenza A(H1N1) component of the 2018-19 Northern Hemisphere influenza vaccine. 15 influenza B viruses were characterized as B/Colorado/06/2017, which belong to the Victoria lineage and are included as an influenza B component of the 2018-19 Northern Hemisphere influenza vaccine. 19 viruses showed reduced titer with ferret antisera raised against cell culture-propagated B/Colorado/06/2017.